This seems like a fitting image to take us into the weekend. An original ink and watercolour wash by Thomas Rowlandson, whose signature appears at the bottom left-hand corner of the paper. It measures approximately 11.5 x 15 inches. The image was originally engraved for the publisher S.W. Fores, who issued it under the title Grog on Board in January 1789. 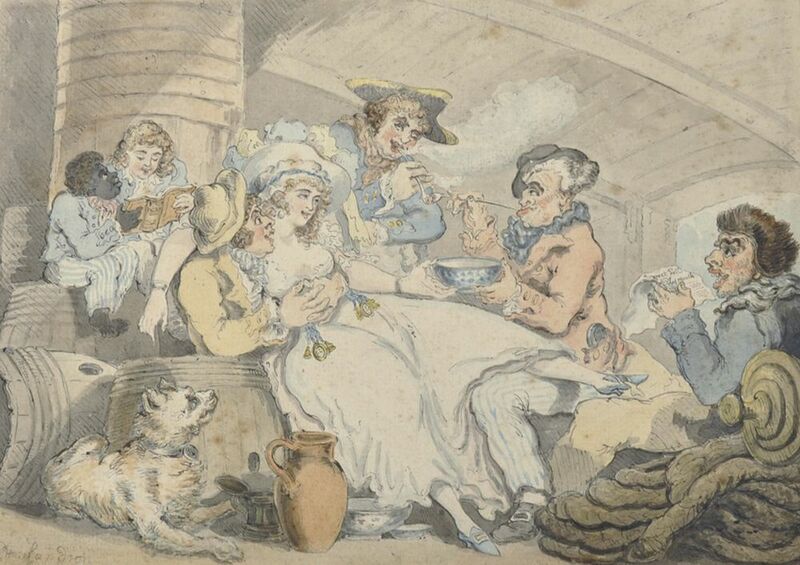 It was originally accompanied by a companion piece titled Tea on Shore, in which the raucous debauchery of the sailors is compared with a polite society gathering. I suspect that this is a later version, drawn after the engraving was issued and possibly dating to the 1800s – 1810s, when the publisher Rudolph Ackermann began selling traced copies of the artist’s original works. It looks a bit too similar to the engraving to have been an original sketch that was produced off the cuff. 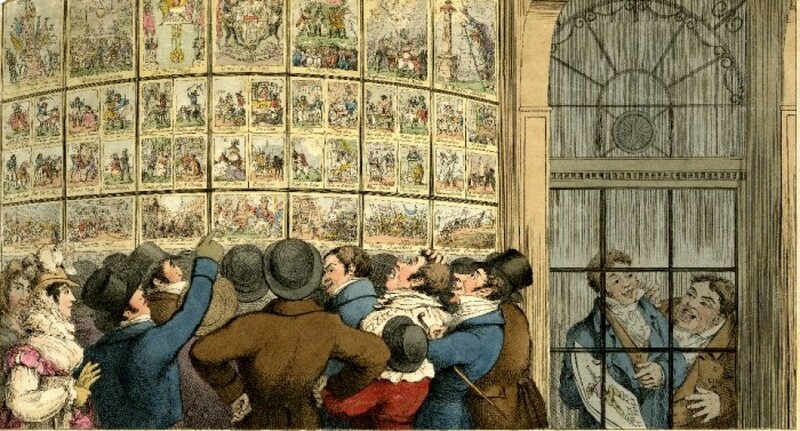 The tone and application of the colouring also appears different (at least to my eye) than the thin washes of delicate colour that Rowlandson usually applied to his watercolours. This picture is due to come up at auction in a couple of weeks. It carries an estimate of £600 – £800. Personally, I can’t quite make up my mind about it. It may be a genuine original, or a ‘licensed copy’ of the kind Ackermann is known to have produced. Alternatively, it could simply be a contemporary amateur copy which has subsequently been passed off as an original? Perhaps something to mull over as I prepare to sail off into the weekend with a healthy cargo of grog on board. This lacquerware box was manufactured in the workshop of Johann Heinrich Stobwasser (1740 – 1829), in the German city of Braunschweig, sometime around 1814. 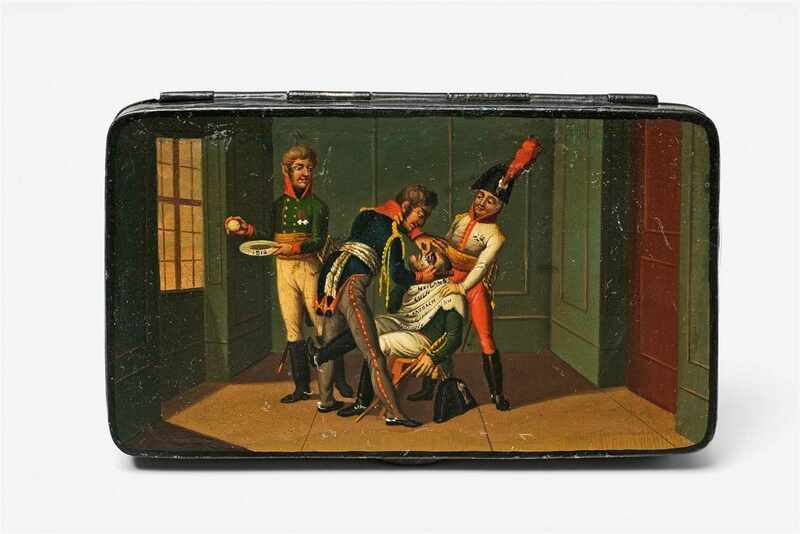 It is decorated with an oil and lacquer image of Die Neue Europaeische Barbierstube, which was engraved by the Bavarian satirical artist Johann Michael Voltz (1784 – 1858) in late 1813. 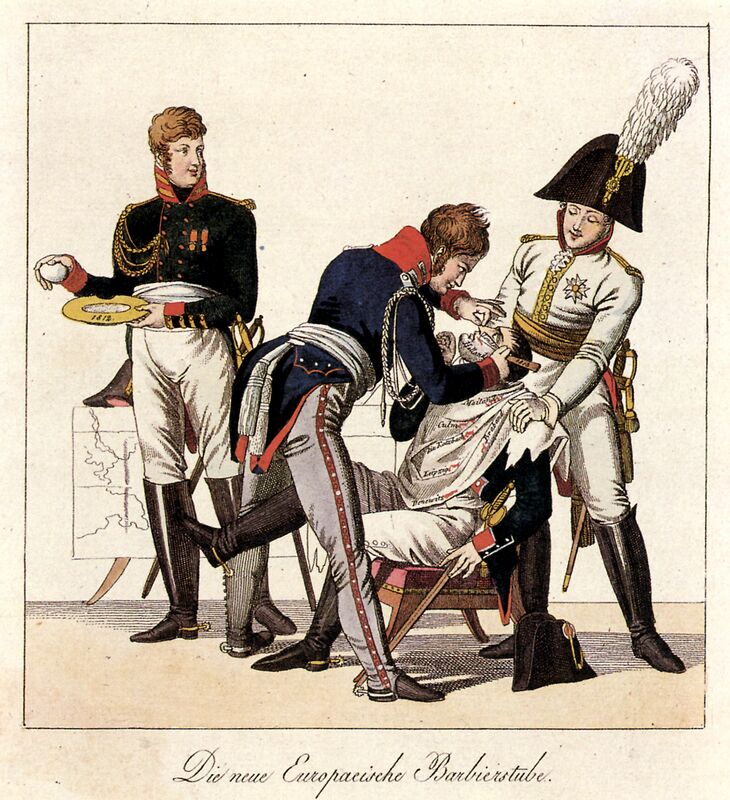 The impact depicts Napoleon being forcibly shaved by (l-r) Alexander I of Russia, Frederick William II of Prussia, and Francis II of Austria. The Emperor wears a bib, which is spattered with blood in Voltz’s original engraving, inscribed with the locations of various French military defeats – “Mailand, Culm, Kazbach, Leipzig, Russland”. Alexander also carries an empty plate labelled ‘1812’ and a white ball – possibly a snowball – which presumably alludes to Napoleon’s ill-fated Russian winter campaign. The Battle of Leipzig had ended on the 19th October 1813 and is the most recent event referenced in the design. It is likely that Voltz’s engraving was published shortly after the battle and then copied in Stobwasser’s workshop sometime during the winter of 1813/14. The box measures 2.3 cm x 14.4 cm x 8.8 cm and will be offered up for auction in Germany later this month. 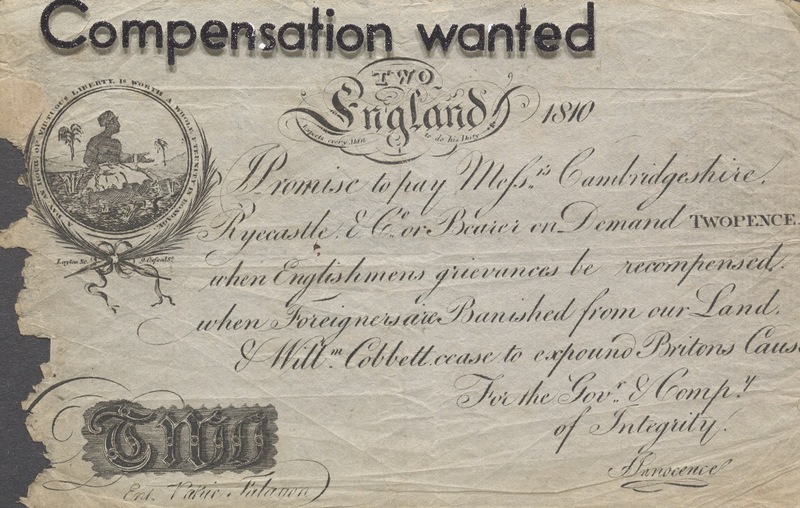 It carries an estimate of £1,700 – £2,100.